This lightweight fluid deposits a true veil of purity on the skin. 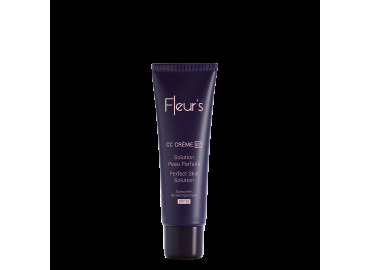 The Purifying Floral Bouquet is combined with a powerful ingredient for a formula that optimizes the skin's balance. Shine fades away and the skin appears purified, as if depolluted. *Satisfaction test on 24 volunteers, after 28 days of twice-daily application. An ultra-light and very comfortbale fluid. An explosion of ultra-fresh and sparkeling floral notes reinforced by the tonic accent of menthol. AQUA (WATER) / EAU, GLYCERIN, CAPRYLIC/CAPRIC TRIGLYCERIDE, KAOLIN, OLIVE OIL DECYL ESTERS, DIMETHICONE, PENTAERYTHRITYL DISTEARATE, DICAPRYLYL CARBONATE, BUTYLENE GLYCOL, CETEARYL ISONONANOATE, CORYLUS AVELLANA (HAZELNUT) SEED OIL, MICROCRYSTALLINE CELLULOSE, PHENOXYETHANOL, SODIUM POLYACRYLATE, SODIUM STEAROYL GLUTAMATE, PPG-26-BUTETH-26, CHLORPHENESIN, PEG-40 HYDROGENATED CASTOR OIL, CAPRYLYL GLYCOL, XANTHAN GUM, ETHYLHEXYL METHOXYCINNAMATE, HYDROGENATED VEGETABLE OIL, PARFUM (FRAGRANCE), SQUALENE, CELLULOSE GUM, METHYL DIISOPROPYL PROPIONAMIDE, TOCOPHEROL, CRITHMUM MARITIMUM EXTRACT, BUTYL METHOXYDIBENZOYLMETHANE, ETHYLHEXYL SALICYLATE, SILENE COLORATA EXTRACT, CITRIC ACID, HELIANTHUS ANNUUS (SUNFLOWER) SEED OIL, POTASSIUM SORBATE, LAVANDULA STOECHAS EXTRACT, CI 77891 (TITANIUM DIOXIDE), CI 42090 (BLUE 1).